It looks like MediaTek has got some very exciting projects up its sleeves, the company just officially announced that it is working on the world’s first true octa-core processor. Unlike Samsung’s Exynos 5 octa-core processor found in the Galaxy S4, it has got all eight cores working at the same time; Exynos 5 has got one group of four cores active at a single time. This means that the processor can deliver a smoother gaming experience, faster web browsing, enhanced multitasking, improved video playback and most importantly, better battery efficiency. If you want a rough idea about the performance of a true octa-core processor, earlier this month, a chipset called MT6592 made its way into AnTuTu benchmark scoring close to 30,000 points. Of course, the score is not as high as Qualcomm’s Snapdragon 800, but it is without a doubt that MediaTek can offer a better value. Clock speed is expected to range from 1.7GHz to 2GHz with video decoding of 1080p at 30fps. MediaTek has already sent out samples to potential customers and mass production is scheduled for this November. 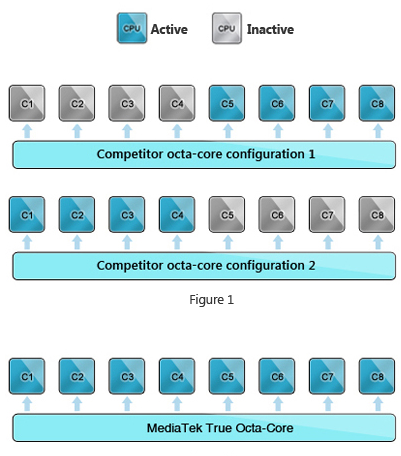 Visit MediaTek for more information about its True Octa-Core processor.